Back in San Francisco Bay after more than eight months at sea, this Saildrone carries scientific instruments, and lots of data. The Saildrone is an autonomous sailing drone, currently being explored by the OCS project as a tool to provide high quality oceanic and atmospheric observations. With a speed through the water of 2-8kts, they have a range of more than 16,000 nautical miles, and endurance of up to 12 months. Saildrones can do adaptive sampling like research ships, but at a fraction of the price. For additional photos, please check our Saildrone Gallery. The second TPOS mission was designed focus on the ability of the Saildrone to make observations along the equator, and involved comparisons against various TAO moorings. The exact course of this mission was dependent upon conditions and events observed at the time, with the route to be directed by scientists while the vehicles are underway, highlighting the adaptability of the Saildrone. This mission is part of a series of Saildrone missions to the tropical Pacific, each focused on specific targeted phenomena for different phases of the El Niño Southern Oscillation (ENSO). Mission 1 (September 2017 – May 2018) occurred during the “Recharge” phase of ENSO, where the cold tongue was developed. This Mission 2 may occur during a “Discharge” phase, with a warm anomaly in the Central and Eastern Pacific regions of the Nino3.4 Index. Future Mission 3 (early 2019) will likely capture the end of the “Discharge” phase, when the warm water is spread to its easternmost extent. This mission was also intended to test the operability and usefulness of the Saildrone platform as part of the larger Tropical Pacific Observing System (TPOS). For more details about the mission, be sure to check out the OCS Saildrone TPOS Mission 2 Blog. On September 1, 2017, two Saildrones departed Alameda, California, on a mission to the equator and back, in an effort to improve the Tropical Pacific Observing System (TPOS). The existing observing system is ready for an update. It was first created in the late 1980s, and provides real-time data used by the US and partner nations to forecast weather and climate, including El Nino, one of the world’s most influential ocean phenomena. The Saildrones visited mooring sites that are part of the existing tropical observing array to carry out comparisons, and also participated in a larger field study with NASA. This mission was a test of whether the Saildrone can provide measurements at a quality that matches research ships and proven mooring technology. If this is the case, Saildrones will become a powerful tool for providing key observations for long-term weather forecasts. After eight months at sea, the Saildrones successfully returned home to California. The first boat was recovered on May 6, 2018 in San Luis Obispo Bay. The second was recovered on May 18, 2018 in San Francisco Bay. Scientists are currently analyzing the data acquired during the mission. Watch the video from the launch below, and review the mission details on the OCS Saildrone TPOS Mission 1 Blog. PMEL began a partnership with Saildrone, Inc. in 2014, under a Cooperative Research and Development Agreement. The partnership aimed to develop the unmanned surface vehicles to collect high quality oceanic and atmospheric observations. In addition to the vehicles themselves, Saildrone, Inc. provides engineering expertise in vehicle design, software, electronics, and operations. PMEL provides engineering expertise on sensors, sensor sampling schemes, telemetry protocols, and access to calibration equipment and facilities. The OCS group has been working together with PMEL engineers and Saildrone, Inc. since mid-2016. 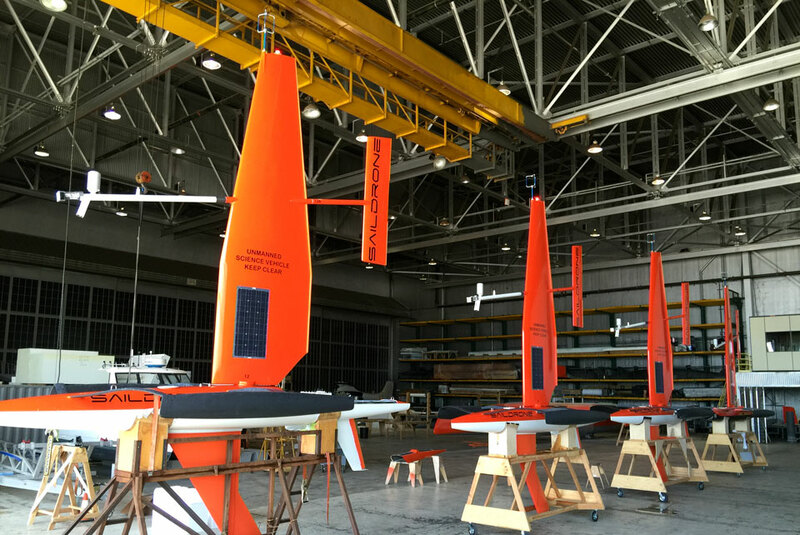 The OCS goal was to install sensors on the drones with equivalent or better quality than those currently used on Tropical Atmosphere and Ocean (TAO) buoys for air-sea flux measurements. New additions made to the Saildrones also included a 300-kHz Acoustic Doppler Current Profiler for upper ocean current measurements, and a suite of biogeochemical sensors. 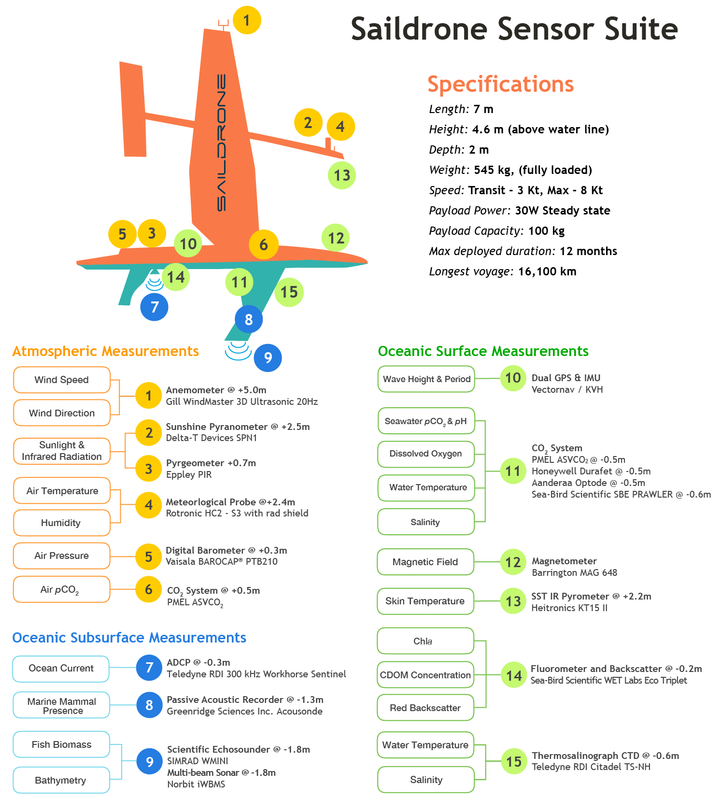 Refer to the Technical Notes page for documentation of the OCS / Saildrone development efforts. 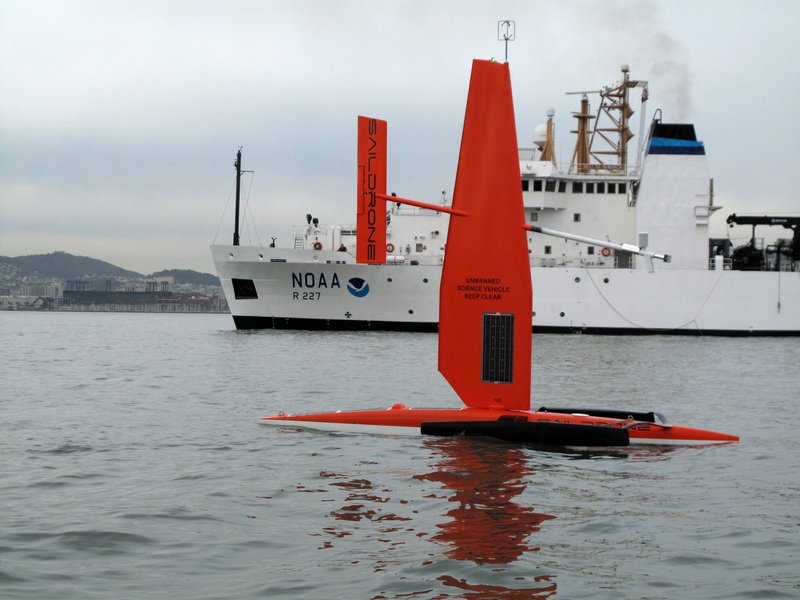 Saildrone vehicle performing a comparison mission with a NOAA ship.